The cheesiest mod there is! 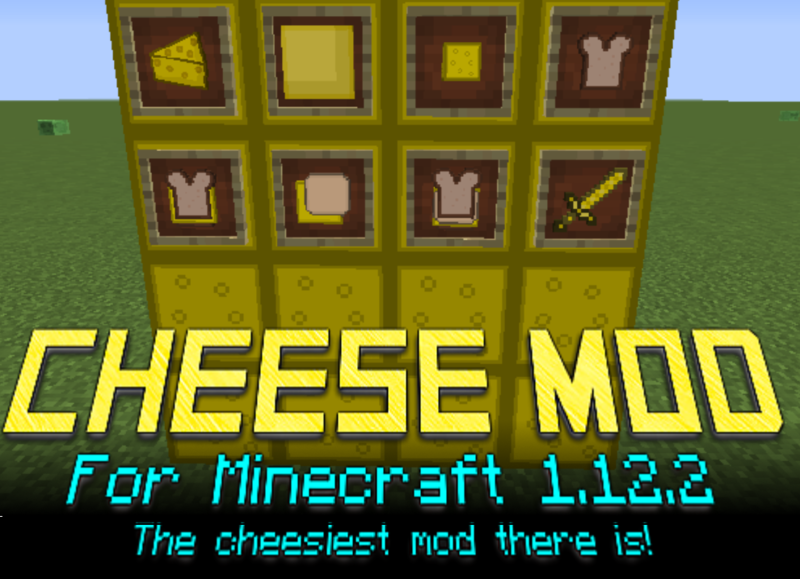 This cheesy mod adds delicious cheese to your Minecraft world. You can eat it or make different items out of it. This also adds items to make some sandwiches with. Cheese: The classic wedge of cheese. Cheese Block: A whole lot of cheese pressed into one big block. Doesn't really have a use yet. Cheese Slice: A sliced version of ordinary cheese. Put this on sandwiches. Sliced Bread: A loaf of bread that has been cut apart. Cheese Sandwich: Two slices of bread surrounding a cheese slice. Ham and Cheese: A combination of pork and sliced cheese that goes on a sandwich. Ham and Cheese Sandwich: A classic sandwich, a piece of ham and a slice of cheese on two slices of bread. Cheese Sword: The most ridiculous item, a sword made from cheese. More items will be added in later updates. Let me know if you have any issues or suggestions, I will usually give a response. Check out http://cheesemodminecraft.ueuo.com/ for an alternative download link.